This document provides a high-level, conceptual overview of Red Hat JBoss Enterprise Application Platform as well as several topics on which JBoss EAP is based. Before understanding how Red Hat JBoss Enterprise Application Platform can be configured and deployed, there are some important concepts to understand. Java is a programming language and a computing platform that incorporates concepts such as object-orientation, classes, and concurrency. Java applications are compiled down to bytecode and are run inside a Java Virtual Machine (JVM). An application server, or app server, is software that provides an environment to run web applications. Most app servers also provide functionality to web applications running in their environment through a set of APIs. For example, an app server can provide an API for connecting to a database. Java EE (Java Platform, Enterprise Edition) is a standards-based enterprise platform that provides both an API and runtime environment for running and developing Java applications. The goal is to improve developer productivity by providing rich enterprise capabilities in easy to consume frameworks that eliminate boilerplate and reduce technical burden. The frameworks that compose Java EE are heavily tested in combination. Java EE 7, based on JSR 342, is a follow up to Java EE 6, with the primary focus being additional simplification of APIs to access container services while increasing support for emerging web technologies, such as HTML5. Java EE 7 includes support for profiles, or subsets, of APIs. The Java EE 7 specification defines the full platform and the Web Profile. The Java EE 7 Web Profile is designed for web application development and supports a subset of the APIs defined by Java EE 7 related web-based technologies. The Java EE 7 full platform contains all of the APIs defined by Java EE 7, including all the items in the Web Profile. When developing EJBs, messaging applications, and web services (in contrast to web applications), use the full platform. Red Hat JBoss Enterprise Application Platform (JBoss EAP) 7.1 is a certified implementation of the Java Enterprise Edition (Java EE) 7 full platform and Web Profile specifications. Major versions of JBoss EAP are forked from the WildFly community project at certain points when the community project has reached the desired feature completeness level. After that point, an extended period of testing and productization takes place in which JBoss EAP is stabilized, certified, and enhanced for production use. During the lifetime of a JBoss EAP major version, selected features may be cherry-picked and back-ported from the community project into a series of feature enhancing minor releases within the same major version family. For example, JBoss EAP 7.1 is forked from a working branch of WildFly 11. JBoss EAP provides preconfigured options for features such as high-availability clustering, messaging, and distributed caching. It also enables users to write, deploy, and run applications using the various APIs and services that JBoss EAP provides. JBoss EAP includes a modular structure that allows service enabling only when required, improving startup speed. The web-based management console and management command line interface (CLI) make editing XML configuration files unnecessary and add the ability to script and automate tasks. In addition, JBoss EAP includes APIs and development frameworks for quickly developing secure and scalable Java EE applications. Java Enterprise Edition 7 full platform and Web Profile certified. Centralized management of multiple server instances and physical hosts, while a standalone server allows for a single server instance. Per-server group management of configuration, deployment, socket bindings, modules, extensions, and system properties. Centralized and simplified management of application security (including security domains). New domain or standalone server management interfaces. The management CLI also includes a batch mode that can script and automate management tasks. Directly editing the JBoss EAP XML configuration files is not recommended. The modules directory contains all application server modules. The domain and standalone directories contain the artifacts and configuration files for domain and standalone deployments respectively. Modules are loaded and unloaded on demand. This improves performance, has security benefits, and reduces start-up and restart times. Database drivers are deployed like other services. In addition, datasources are created and managed using the management console and management CLI. Many of the APIs and capabilities that are exposed to applications deployed to JBoss EAP are organized into subsystems. These subsystems can be configured by administrators to provide different behavior, depending on the goal of the application. For instance, if an application requires a database, a datasource can be configured in the datasources subsystem and accessed by that application after it is deployed to that JBoss EAP server or domain. High availability (HA) in JBoss EAP refers to multiple JBoss EAP instances working together to provide applications that are more resistant to fluctuations in traffic, server load, and server failure. HA incorporates concepts such as scalability, load balancing, and fault tolerance. In addition to providing functionality and APIs to its applications, JBoss EAP has powerful management capabilities. These management capabilities differ depending on which operating mode is used to start JBoss EAP. JBoss EAP offers a standalone server operating mode for managing discrete instances and a managed domain operating mode for managing groups of instances from a single control point. Below are several examples to illustrate how JBoss EAP works and where it fits into different environments. This example shows a simple JBoss EAP setup. The JBoss EAP instance has two applications deployed to it. It is also configured to connect to a database using the datasources subsystem and a Kerberos server which can use either the legacy security subsystem or the elytron subsystem. These connections are exposed to the deployed applications. The JBoss EAP instance handles requests through the undertow subsystem and directs those requests to the appropriate application. 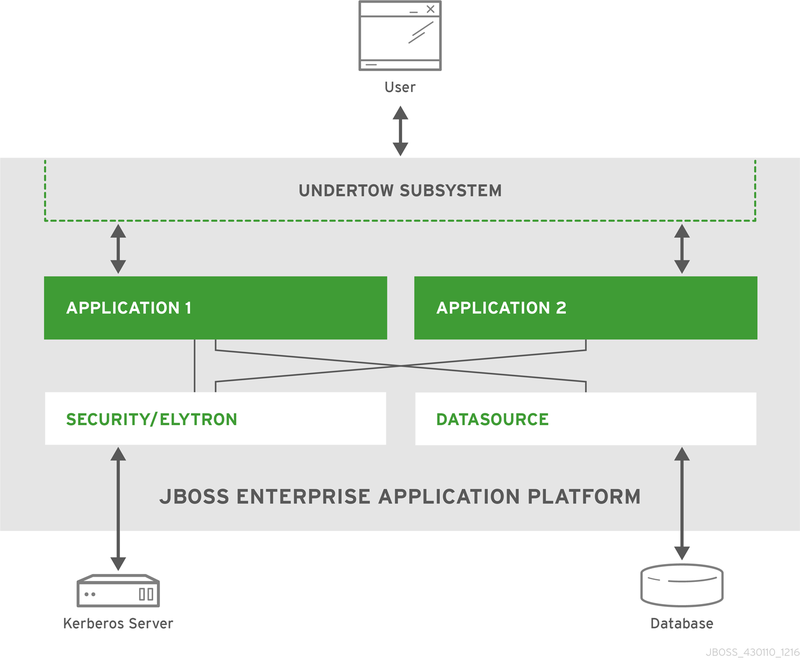 The applications use the APIs exposed by JBoss EAP to connect to the database and Kerberos server, and perform their implemented business logic. After completion, the applications send a response back to the requester through the undertow subsystem. This example illustrates a more complex setup involving three JBoss EAP instances arranged in a managed domain with either a load balancer or a web server. The three instances are also configured to support high availability through load balancing using mod_cluster and session replication using Infinispan. All three JBoss EAP instances have a web application, a web service, and EJB deployed. One JBoss EAP instance has a JMS queue configured through the messaging-activemq subsystem. All three JBoss EAP instances have connections to a database through the datasource. They also have a connection to the LDAP server using either the legacy security subsystem or the elytron subsystem. 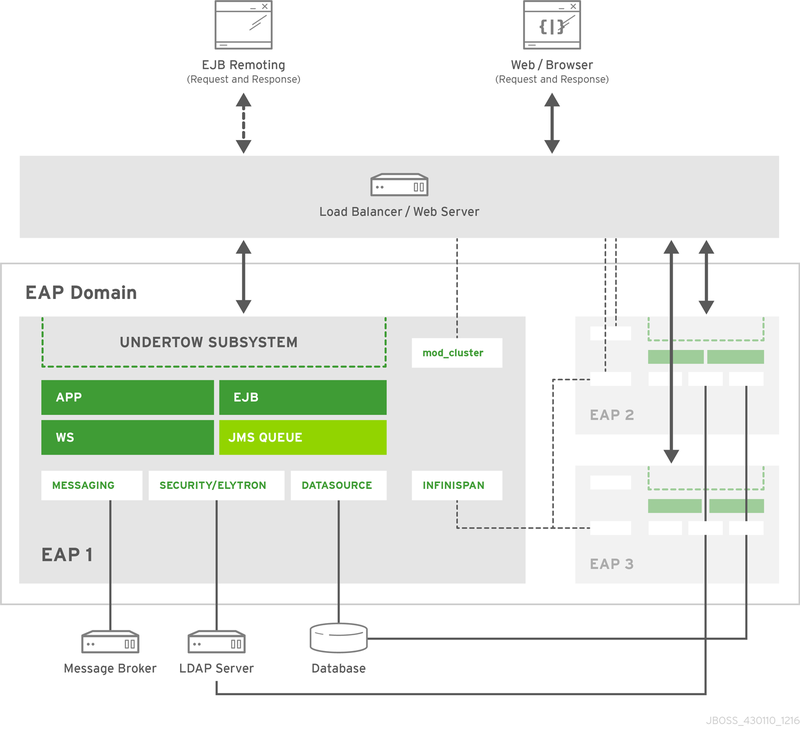 In addition, one JBoss EAP instance is configured to connect to an external message broker through the messaging-activemq subsystem. Those configured connections are exposed to the applications, web services, EJBs, and JMS queues deployed to that respective instance. All inbound requests intended for the application, web service, or EJB are first received by the load balancer or web server. Based on the configured load balancing algorithm and the information provided by each JBoss EAP instance, the web server or load balancer directs that request to the appropriate JBoss EAP instance. The JBoss EAP instance handles requests through the undertow subsystem and directs those requests to the appropriate application. The applications use the APIs exposed by JBoss EAP to connect to the database and Kerberos server, and perform their implemented business logic. After completion, the applications send a response back to the requester through the undertow subsystem. Any non-persisted information, for example session information, is propagated among the JBoss EAP instances through the infinispan subsystem.